Retiring to the living room after dinner is an event to look forward to with a new custom made Amish Liberty Mission Entertainment Center well......at the center of things! Rich solid wood defines this gorgeous living room furniture that hosts your TV and provides shelves to store media neatly. The Liberty Mission Entertainment Center with Two Shelves is shown here in rustic quarter sawn white oak wood with Ohio certified stan 110 medium finish. 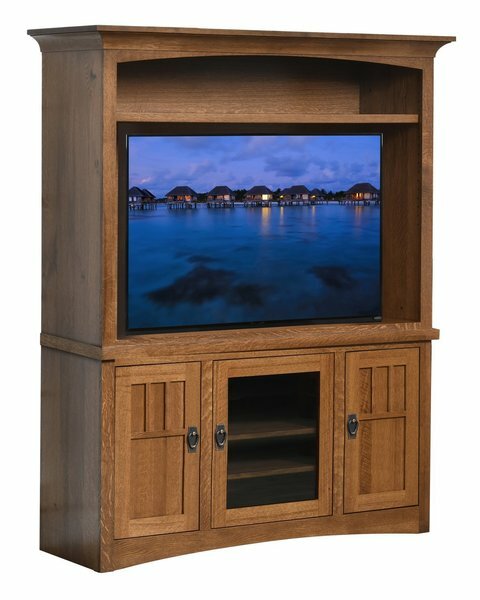 With a beautiful solid wood glow and mission style strength, this entertainment center is one that can be passed on to future generations. Custom options leave you with lots of choices. If you'd like assistance choosing a wood type or finish color, please email or call us today and a friendly Furniture Specialist will assist you. You've found heirloom quality furniture and we can't wait for it to become part of your family story.